Intercontinental Hotels Group (or IHG) often has at least one promotion going on at any given time and their most recent one is a bit different than usual. About a year ago, I took advantage of IHG’s “Into the Nights” promotion in order to earn free hotel nights that we later used to save a ton of money on hotels during our New York City trip. The end result of pursuing that promotion was 4 free nights in the NYC Intercontinental for an out of pocket cost of around $140, so it definitely pays to pay attention to hotel promotions because you never know when one can pay out big. IHG’s latest promotion, “Priceless Surprises”, rewards you with a random prize (mostly IHG points) after making stays at IHG properties, but thanks to the random nature of the promotion and US gambling laws, there’s a way to get the same prizes without spending any money at all*! (*No money on hotel stays at least, you’ll still have to pay for index cards, envelopes, and stamps.) I’ll break down all the details below and you can decide for yourself if the rewards are worth your time. As the promotion is considered a “Sweepstakes” or “Instant Win Game”, IHG must provide a way to enter that doesn’t cost any money in order to qualify under the “No Purchase Necessary rules that prevent sweepstakes from being considered gambling. The FTC has a lot of fine print on the subject if you’re into that sort of thing. Mail in Alternate Method of Entry: From November 15, 2015 to February 15, 2016: You can enter the Instant Win Game without completing a Qualifying Stay. However to be eligible for the chance to win prizes in section 9 below you are required to have an IHG Rewards Club account. If you do not have one, you can sign up for free by visiting http://www.ihg.com/rewardsclub/us/en/home and following the instructions. To enter without completing the minimum two Qualifying Stays, hand print your full name, complete mailing address, day and evening phone numbers, valid email address, member number, the first six (6) digits of your MasterCard and date of birth on a 3″ x 5″ piece of paper and mail it in an envelope with proper postage to “IHG and MasterCard® Priceless Surprises® Promotion,” c/o HelloWorld, Inc., P.O. Box 5996, Kalamazoo, MI 49003-5996. Once your mail-in request is received, you will receive an email within five (5) business days from the Administrator inviting you to play the Game and you will receive one (1) Game play for each mail-in request. Limit: One (1) request per envelope. Once you receive an email inviting you to participate in the Game, click on the link found within the email and follow the links and instructions to play the Game. The Game results will be instantly displayed. Potential winners of the Game will be provided directions for validation. All potential winners are subject to verification before any prize will be awarded. Administrator is responsible for the functionality of the Instant Win Game. All mail-in entries must be handwritten and must be postmarked by February 15, 2016 and received by February 22, 2016. All entries become the exclusive property of Sponsor and none will be acknowledged or returned. Proof of sending or submission will not be deemed to be proof of receipt by Sponsor. Sponsor is not responsible for 308468.1 lost, late, incomplete, invalid, unintelligible, illegible, misdirected or postage-due entries, which will be disqualified. All Game plays must be completed by March 15, 2016 at 11:59 p.m. ET. What’s kind of odd is the number they chose, 94. The “normal” way to qualify for an entry is having a stay that starts between November 15th and February 15th, starting after the 2nd stay. Counting the days between the start and end of the promotion (start and end dates included) yields a total of 93 days. This at least explains where the number came from, but they added a couple extra days on top. A person who manages to complete a Qualified Stay on every single date of the promotion would only get 92 entries! Keep in mind a stay is not equal to a night, completing that many stays would require switching hotels every single night for several months! The first thing you should do it register for the promotion! If you fail to register before mailing in entries, there is a good chance you won’t get anything. After mailing the card in, you should receive an email with a link to your entry into the promotion after they process your information. Now what kind of value are we looking at for participating in this promotion? When the promotion initially was announced, there was some confusion as to whether or not each entry would receive at least the minimum prize of 500 IHG points. After some people talked with IHG reps, it appears that every entry WILL get at least a minimum of 500 IHG points. The recent data points on reddit reflect this as well. Looking at a worst case scenario of only getting 500 IHG points per entry, you’re looking at a minimum of 47,000 IHG points if you complete all 94 entries. 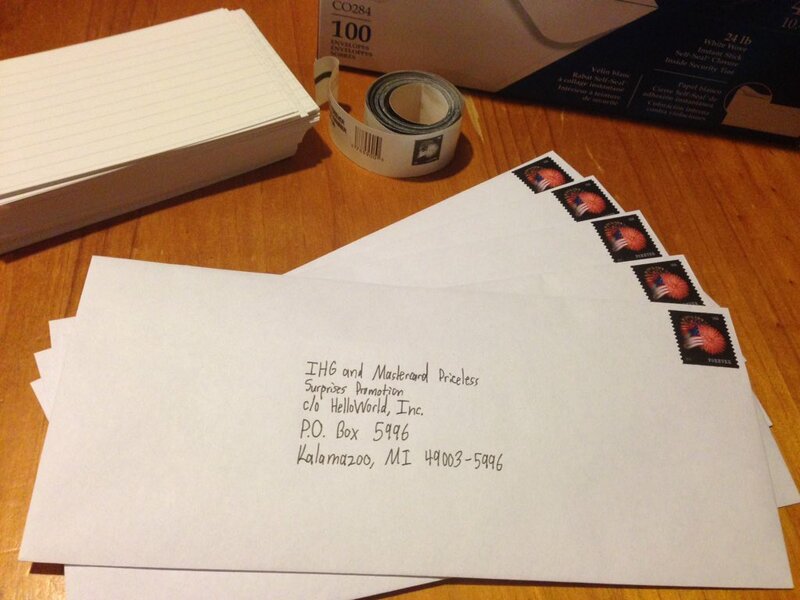 The bulk of the cost of each entry is the stamp, but you also have to take the envelope and index card into account as well. I didn’t spend a lot of time looking for the best deal and ended up ordering all 3 on Amazon for a total cost of $58.98 for 100 envelopes, index cards, and stamps. I used my Discover It card for the purchase, so I’ll be getting 10% back, making my effective total cost $53.08 for 100 entries or $49.90 for 94 entires assuming I get value out of the left over materials (shouldn’t be hard to do). That brings the effective cost of a single entry down to just over 53 cents. Assuming all entries pay out the minimum 500 points, we’re essentially buying points for around 0.1 cents per point. I’m definitely not an advocate for buying points, but in this case I think it can be worth it if you’ll actually use them towards a hotel stay. Let’s look at it from the perspective of what we can book after chugging through all of the possible entries. For a total cost of $49.90, we will end up with a minimum of 47,000 points, but I’m going to be a little generous and guess you’ll win a slightly higher amount than 500 on at least a few entries and round it out to an even 50k IHG points. 50k IHG points is enough to book 1 night in ANY IHG property, including the many Intercontinental properties located around the world. On the other hand, 50k points could be worth up to 10 nights if you take advantage of IHG’s frequent Points Break deals that lower the cost of booking with points to 5k/night at select properties. That’s anywhere from 10 nights at a limited selection of properties to 1 night at any IHG property for the low cost of ~$50! If you have the IHG credit card, the payout can be even better because of the 10% rebate on points redeemed (up to 100k back per year)! I actually ordered the supplies on Amazon a few weeks ago, but didn’t start filling them out until I got a little inspiration from the people starting to receive the email entries. At this point, I’ll be mailing in my first batch today and plan to finish out all 94 entries by the end of December. Becky also has her own IHG account and the promotion doesn’t limit the entries per household, so we’ll probably end up sending in 94 entries for her as well. IHG points are easy to keep alive indefinitely, so even though we don’t have a plan to use the points earned yet, I’m sure a minimum of two nights for the low cost of $50 each will definitely come in handy at some point in the future. I have sent in 80 entries so far and I received emails back on 20 of them. Of the 20, I won 500 points on each of them, except one that I won nothing. So, it is possible to win nothing on a few. After I won the 500 points, it said I would receive an email telling me how to redeem the points. So far, no email, and the points haven’t shown up in my account. I’m sure it will all work out but nothing yet. Thanks for the data point, you’re the first I’ve heard who hasn’t won anything with an entry. Did you happen to capture a screenshot of the loss? It’s not that I don’t believe you, but I’d love to update with proof that it’s possible to not win anything. I unfortunately did not see a need to capture a screen shot at the time. However, when I won the 500 points, each time there was a background of a blue sky with fireworks. When I didn’t win, there was a background of a shot of the Eiffel Tower so I got excited but then it said, “sorry you didn’t win this time”. I have 74 more entries yet to go so I’m sure we will have a lot more data points. Thanks for the update. I’m sure we’ll see a lot more data points as more people start getting the emails. Hopefully all of mine are winners! I’m in the same boat. I got a bunch of emails saying I had gotten points- mostly in the 500 point range- and that I’d get more info on how to redeem the points. I’ve waited 72 hours and have not received any follow up emails on how to redeem them nor any points deposited into my account. Has anyone had this experience? How long have you had to wait for the follow up emails to arrive? I haven’t received any of my entries yet, but I haven’t seen any data points yet from people actually seeing the points in their account or the email with more info on how to redeem them. I haven’t seen any official word on when the prizes won can be redeemed, but it’s entirely possible no points will be released until the end of the promotion period on March 15th. Keep in mind the last time to enter is February 15th. As always, patience is key. Can I only mail in 1 entry a day or I can mail in as many as I want. I know total can be only 94 – but do that have to be broken down to 1 a day or can be multiple mails everyday. You should have no problem mailing any number of them per day, the only restriction is 94 total. Either sending 94 all on the same day or breaking it into smaller batches should each work fine. Been sending them in every day. I haven’t gotten a SINGLE RESPONSE. I’ve checked my spam folder and looked everywhere else. What should I do? What day did you first start mailing them in? The contest officially started on November 15th and many people that mailed in letter on that day didn’t receive a response until December 4th or so. That’s almost 20 days from mailing it out for the people who got in the earliest. If a lot of people are taking advantage of this offer, I imagine it may take even longer to get a response. The contest runs until February, so I would just be patient. Note: The emails are coming from IHGRewardsClub@eprizepromotions.com last I heard, so you can add a rule to your email to prevent them from being filtered to spam or elsewhere. Hi, I just wondering if these rewards expire. I recently got the IHG CC, but I am not sure if this will prevent me from losing my points. IHG points normally expire if there is no account activity for 12 months. If you have the credit card open, you automatically get elite status and elite status prevents your points from expiring. Ah, OK. So does that also means that if I use points, that counts as account activity? Yes, earning or spending points would both count as activity to reset the 12 month clock.